E.A. Fleishman, J.N. Cleveland, Series Foreword. Part 1: Work Analysis Methods. M.A. Wilson, Part 1 Introduction: Work Analysis Methods. M.A. Wilson, Methodological Decisions in Work Analysis: A Theory of Effective Work Analysis in Organizations. T. Powell, M. Woodhouse, N. Guenole, Selling Work Analysis. E. Johnson Guder, Identifying Appropriate Sources of Work Information. D. Van De Voort, T. Whelan, Work Analysis Questionnaires and Interviews. E. Dierdorff, Using Secondary Sources of Work Information to Improve Work Analysis. R.J. Harvey, Analyzing Work Analysis Data. E.L. Levine, J.I. Sanchez, Evaluating Work Analysis in the 21st Century. A. Gutman, E.M. Dunleavy, Documenting Work Analysis Projects: A Review of Strategy and Legal Defensibility for Personnel Selection. Part 2: Work Analysis Systems. S. Gwaltney Gibson, Part 2 Introduction: Work Analysis Systems. M.A. Wilson, J.W. Cunningham, Important Contributors to Job Analysis in the 20th and Early 21st Century. M.A. Rosen, E. Salas, E.H. Lazzara, R. Lyons, Cognitive Task Analysis: Methods for Capturing and Leveraging Expertise in the Workplace. D.J. Gillian, Five Questions Concerning Task Analysis. S. Gwaltney Gibson, Generalized Work Dimension Analysis. J.J. Caughron, M. Mumford, E.A. Fleishman, The Fleishman Job Analysis Survey (F-JAS): Development, Validation, and Applications. J. Foster, B. Gaddis, J. Hogan, Personality-Based Job Analysis. S.F. Cronshaw, Functional Job Analysis. J.D. Levine, F.L. Oswald, O-Net: The Occupational Information Network. R. Poncheri Harman, Context Analysis. Part 3: Work Analysis Applications. G. Alliger, Part 3 Introduction: Work Analysis Applications. A.M. DuVernet, Using Job Analytic Information to (Re)Design Jobs: Best Practices and Methods. G.M. Hurtz, C.W. Wright, Designing Work Descriptions to Maximize the Utility of Employee Recruitment Efforts. D.A. Biddle, J.E. Kuthy, Using Job Analysis as the Foundation for Creating Equal Employment Opportunity in the Workplace. D. Doverspike, W. Arthur, Jr., The Role of Job Analysis in Test Selection and Development. D.L. Whetzel, M. McDaniel, J.M. Pollack, Work Simulations. S.G. Roch, K. Williams, Building Effective Performance Appraisals from an Analysis of Work. E.A. Surface, Training Needs Assessment: Aligning Learning and Capability with Performance Requirements and Organizational Objectives. R.J. Harvey, Compensation. S.G. Atkins, Career Planning: The Role of Work Analysis in the Work of Your Organization's Career Development Manager. B.M. Stone, R. Vasquez Maury, Using Job Analysis Data to Perform Activity-Based Utility Analysis: Enhancement of a Technology. D.L. Sandall, J. Henderson, R. Reiter-Palmon, M. Brown, S.R. Homan, A Comprehensive, Interactive, Web-based Approach to Job Analysis: The SkillsNET Methodology. Part 4: Work Analysis Research and Innovation. W. Bennett, Jr., S. Tsacoumis, Part 4 Introduction: Work Analysis Research and Innovation. R.J. Harvey, M.A. Wilson, What and Who? Research and Conclusions on Two of the Most Important Questions in Job Analysis. F.P. Morgeson, M.A. Campion, A Framework of Potential Sources of Inaccuracy in Job Analysis. G.M. Alliger, R. Beard, W. Bennett, Jr., C. Colegrove, Understanding Mission Essential Competencies as a Job Analysis Method. T.R. Gordon, M.D. Coovert, L.R. Elliott, Integrating Cognitive Task Analysis and Verbal Protocol Analysis: A Typology for Describing Jobs. W. Arthur, Jr., A.J. Villado, W. Bennett, Jr., Innovations in Team Task Analysis: Identifying Team–Based Task Elements, Tasks, and Jobs. C.E. Lance, T. Lambert Griggs, R.B. Gould, Development and Evaluation of a Task Taxonomy To Support Research on Cross-Job Transferability of Skills. P.W. Foltz, R.J. Oberbreckling, R.D. Laham, Analyzing Job and Occupational Content Using Latent Semantic Analysis. R. Lyons, P. Musaeus, E. Salas, K.A. 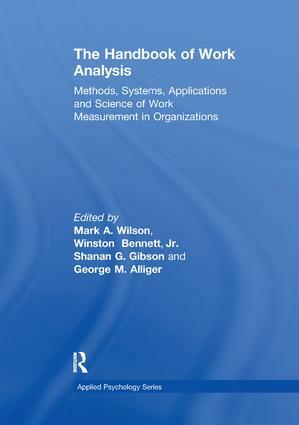 Wilson, The Science and Practice of Job Analysis Abroad. W. Bennett, Jr., G.M. Alliger, M.A. Wilson, S.G. Gibson, Concluding Thoughts: Challenges and Opportunities in Work Analysis. Shanan Gwaltney Gibson (Ph.D., Virginia Tech) is an Associate Professor of Management at East Carolina University. Shanan’s research focuses on topics relevant to human resources and organizational development including work analysis, entrepreneurship and technology in organizations. She currently serves as a member of the Social Security Administration’s Occupational Information Development Advisory Panel. Active in several professional organizations such as the United States Association for Small Business and Entrepreneurship, the Small Business Institute, and the Southeastern Chapter of the Institute for Operations Research and the Management Sciences, Shanan is also an Associate Editor of the Small Business Institute® Journal. Shanan received her Ph.D. in Industrial and Organizational Psychology from Virginia Tech.